Learn martial arts and self-defense from the Masters, Sifus, and Black Belt Instructors from the Tat Wong Kung Fu & Kickboxing Academies in San Francisco, San Mateo and Concord, California. We offer the best of martial arts with kung fu, kickboxing, self-defense, and adult fitness training, in classes that are specifically designed for the mature student. From the beginning introductory lessons, through our beginner kung fu classes, our curriculum guides students step-by-step through the technical material. The ongoing beginner, intermediate and advanced classes teach adult students not only the traditions of chinese martial arts, but practical self-defense strategies, and all the movements, intricacies, and applications of the many Kung Fu techniques and forms. Students also get to learn many Chinese Martial Arts weapons forms, including the shaolin staff form, mui-fa staff form, tiger-tail sword, and kung fu spear, and there are many more. This means students become more coordinated than most could imagine and this all translates into a happy and confident students. Many of our adult students have little or no martial arts background before training with us. However, they soon develop skills they initially thought would be difficult. Our students are eased into the rigors of martial arts training, so to develop strong self-defense and kung fu skills while achieving fitness goals, all in positive and energetic classes. 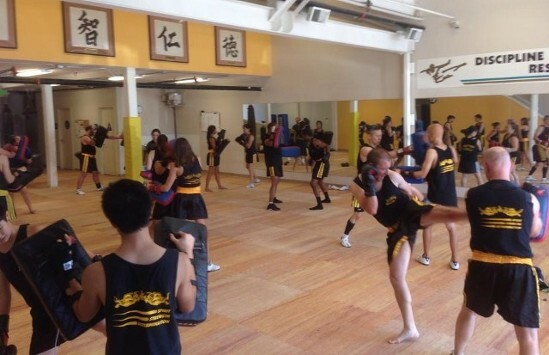 We also have many focused and intent teens who have found our kung fu and kickboxing classes unique and athletically challenging. Adult students find the fitness and coordination benefits from the martial arts training is distinctive, beneficial both mentally and physically, and much more interesting then typical club style cardio work-out programs. Our students tell us that there is no other workout or sport that accomplishes so much in such an efficient way; getting fit in an interesting way and learning valuable self-defense skills at the same time! 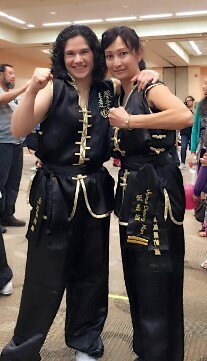 Grandmaster Wong was a full-contact champion in Southeast Asia and Hong Kong, and now passes on his fighting knowledge to our Instructors and students who want to compete in kickboxing and mixed martial arts competitions. Master Chow, Master Farrar, Sifu Mike Lee, Sifu Felipe Godoy, and Sihing Brandon Chew have all competed in full-contact kickboxing events. Whether in the local or national and international arena, many of our instructors and students have gained experience from the USA and Canada, to Brazil and Asia as well. Kickboxing classes for adults and teens are offered at the Academy and also within the kung fu curriculum for kids and adults who want to learn the complete style of kung fu and kickboxing. Some of the kickboxing competitions include mixed martial arts techniques with throws and take-downs of which the advanced kung fu and kickboxing classes at the Academy will prepare students for. If you want to compete or just learn kickboxing skills for exercise, give us a call or e-mail us to try a class and get started in this thrilling martial arts sport. through Friday, between 10:00 AM - 2:00 PM on Saturdays and, at the San Francisco Academy also between 10:00 AM - 1:00 PM on Sundays. and intro class or get started right away with our online registration!